In our commitment to address all your skin concerns, we have gathered and reviewed 5 of the top razors available in the market today. These razors were then evaluated based on their usability, friendliness on the skin and affordability for us to determine what we think is the best razor for sensitive skin. Fans of electric razors should try ES-LT41-K Arc3 3-Blade Electric Razor, Cordless by Panasonic. It has a pivoting head that glides effortlessly for a cleaner and more accurate shave. 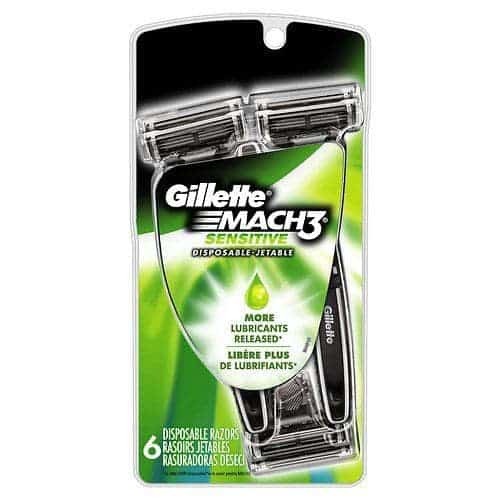 The Mach3 Men's Disposable Razor, Sensitive by Gillette comes with Lubrastrips to ensure a smoother glide. It comes with an Elastomer Handle to ensure a comfortable hold while shaving. BIC’s Twin Select, Sensitive Skin promises a safer, closer, and a more comfortable shave. It comes with a longer handle for better control and more maneuverability. Schick’s Intuition Sensitive Care Razor for Women comes with a pivoting head to follow a woman’s natural curves. It is enriched with Aloe and Vitamin E to moisturize skin while shaving. Say hello to smoother, hair-free skin with our list of the best razor for sensitive skin below. Its 3-blade cutting system and pivoting head make this the best razor for sensitive skin. Multiple blades allow for lesser irritation, while a pivoting head allows for more accuracy while shaving. Each of its blades is honed to a 30-degree angle designed to cut hair from the base, allowing for more precision. These blades are also hypoallergenic and stainless to not irritate sensitive skin. It allows you to make up-and-down and side-to-side movements with ease. Travel-friendly, this rechargeable razor delivers fast and precise shaving at speeds of up to 13,000 cpm. Convenient, what’s great about this product is it’s waterproof. You have the option to use this inside the shower, or on the sink with your favorite gel or cream for a smoother shave. This razor comes with a 10-stage LED on its handle to act as a charge indicator and to show battery life. It charges for about an hour, which is good for around 15 uses. Cleaning-up is a breeze as well. Just place the head under running water and let the excess stubble and gel be removed by its Sonic Vibration Mode. This razor offers a painless shave with its perfectly aligned Mach3 blades. With these three Mach3 blades, you only require fewer strokes which means less irritation. It also promises a comfortable and effortless shave with its Advanced Microfin Comfort Guards. These 5 Microfins allow for a comfortable and closer shave as it follows the shape of the face. Each of its blades is patented in a DLC (Diamond Like Coating,) to maintain sharp and strong blades for a closer cut. It also has an open Architecture System which makes rinsing a breeze. This product also comes with lubrastrips that offer a smoother glide. Once it can no longer provide an optimal shave, these strips gradually turn to white as an indicator. It comes with an ergonomic handle, which gives you greater control every time you shave. Its handle is also covered in elastomer which allows for a more comfortable hold. This product also goes a long way. According to one customer, a 6-pack refill would last him for approximately 6 months, and that he could use one razor at least 20 times. This product’s twin blade offers a comfortable and closer shave and is especially designed for sensitive skin. Its blades are of high-quality stainless steel to make sure they don’t rust easily. These razors also come with a narrow and a fixed head. This ensures to reach sensitive areas with 100% accuracy. What’s great is that these come with a tapered, longer handle and a slimmer head for greater control. The blades are very sharp, and offer a really neat and close shave despite the price. Women enjoy using these because they’re cheap yet still get the job done. They shave without any razor burns, and a reviewer even stated she uses this on her clients prior to getting a tattoo. You’ll love this razor because it is extremely lightweight. Because it doesn’t come with any heavy materials and with only two blades, those who hate heavy razors will like this product. For a disposable razor, this one’s awesome because it comes with Vitamin E and Aloe Vera, two essential ingredients to keep the skin moisturized and healthy. This product’s pivoting head with four blades makes this the best razor for sensitive skin. It is also infused with Vitamin E and Aloe which help moisturize the skin even while shaving. This is called the Skin Conditioning Solids, filled with moisturizing ribbons that help leave skin smooth during shaving. It actually lathers when it comes in contact with skin. Having multiple heads means there’s a lesser chance of irritation since you’ll be using fewer strokes. A pivotal head means it follows a woman’s natural curves. This razor can give you a quick and an easy shave. It lathers and moisturizes while shaving, so body washes, shaving gels, or soap are not required when using this product. What we really like is its ergonomic handle. It has a soft rubber grip which leads to a more comfortable hold and greater control. Additionally, it comes in an eco-friendly packaging. It claims that 55% of it comes from recycled materials, compared to the previous version that comes in pure plastic. This product takes pride in its three-in-one blade design. It promises to remove hair easily and in half the time without any discomfort and pain. Its shaver head features a thin shaving foil and two integrated long hair trimmers. This makes this shaver perfect for the underarms, bikini line, legs, and arms. What we really like about this product is its aesthetic design. It comes with a convenient and easy grip handle, which makes handling and removal of short hair quick and easy. This product promises a mess-free and a hassle-free experience with every use. It even cancels out the use of hair (removal) treatments that could possibly damage or burn sensitive skin. Most importantly, this product is very portable and convenient. It is so compact and can fit inside your bag, and since it’s battery-operated, cables are not needed to use this electric shaver. It is however off-limits to water, as it can cause damage the product itself. It is also advisable to change the battery regularly, as a drained one can pull out the hairs instead of cutting it. For those who have sensitive skin, finding the right razor can lessen your fear of shaving and free you of any bumps. Classified into two types, razors can be an electric or a traditional one. The traditional types are usually safety or disposable razors. Disposable razors can be convenient and cheap, but they usually come with low-quality blades that cause skin irritation. This is why safety razors are preferred if you have thick hair or sensitive skin. Also, you may want a razor that permits you to change blades from time to time (preferably after 5 to 7 uses.) See to it to use a shaving cream or gel when using this type to avoid any dryness. These act as a lubricant between the razor and the skin to reduce getting irritation or bumps. Electric razors, however, don’t offer a close shave but are less likely to cause irritation. Choose ones with a flexible head and dispense a lubricant for a nick-free, more comfortable shave. Men prefer a close shave when working with their faces, so precision and a sharp blade are key. A single-edged blade is more than enough when choosing a disposable or a safety razor. Women will benefit from contoured electric razors when shaving the leg area or the underarms.For the traditional kinds, opt for those that have a flexible head to work more with your curves. Shaving with the right kind of razor can add up to how you look. People often overlook this idea, but having a razor that does not irritate sensitive skin can really help do wonders. We’ve chosen the ES-LT41-K Arc3 3-Blade Electric Razor, Cordless by Panasonic as the best razor for sensitive skin. Waterproof, it can be used inside the shower or on the counter, wherever you prefer. With a 3-blade cutting system with ultra-sharp 30° Nanotech blades, it ensures a close and fast shave without the hassle. It also has pivoting shaving head for closer and more accurate shave.